While I’m not inclined to burn a lot of words on a 4-song release that skates by in under 30 minutes, Umbrose’s debut, Final Nights, is worth bringing to your attention. 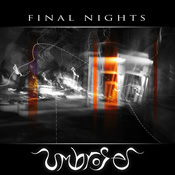 It’s something of a showcase release, giving the listener four sides of Umbrose’s musical personality. The opener, “How Many Winters,” would lead you to believe this is something of a New Age disc. Rain, a wolf howl, then strings, flute and keys set the tone. Light electronics fill in the background and a beat with some tribal pedigree knocks out a tempo. It’s the vocal drop-in late in the track that suggests this isn’t a by-the-numbers New Age outing. And with the first rap of the snare drum on “Crushed Like Velvet (Velour),” it’s confirmed. Now we’re in a somewhat jazz-infected space. The drum plays a simple, slogging beat as a piano offers a half-awake tune. A woman’s voice slips out of a dreamspace and into our hazy awareness. Melancholy drips onto the floor. Again, don’t get comfy. Those are warped carnival music sounds you hear as “MMN” opens, but they give way to an even more stupor-draped chunk of post-rock. Some of the sound here is muddy, dimmed and fading, half here and half not. Then there’s my favorite track, the one that takes the disc to a completely different and quite unexpected place. “The Crying Mask” is an insanely catchy thing that’s basically the theme music for a lost 50s B-movie about spies and aliens, with a surfing contest thrown in for good measure. Wailing theremin sound, snappy snare drum, groovy licks on dirty guitar… If you don’t hear just a little hint of the rockin’ theme from The Munsters, well…it’s probably just that you’re younger than I. But it’s there. And it’s cool. On their Facebook page, Umbrose notes themselves as a “dark ambient” act. If this is dark ambient, it’s really light dark ambient. It’s moody, for sure, and draped in gloom, but overall it’s too bright in tone for that designation. No dark ambient rocks out the way “Crying Mask” does. Whatever you want to call it, Final Nights is a solid, fun and interesting debut that makes me look forward to something longer from Umbrose. Have a listen.